Joined by Sky Sports Head of F1 Martin Turner and a team of adventurous friends and colleages, Dave Clark (Sky Sports’ darts presenter) walked Wainwright’s epic English Coast to Coast in September 2016. Dave was diagnosed with Parkinson’s in 2011. 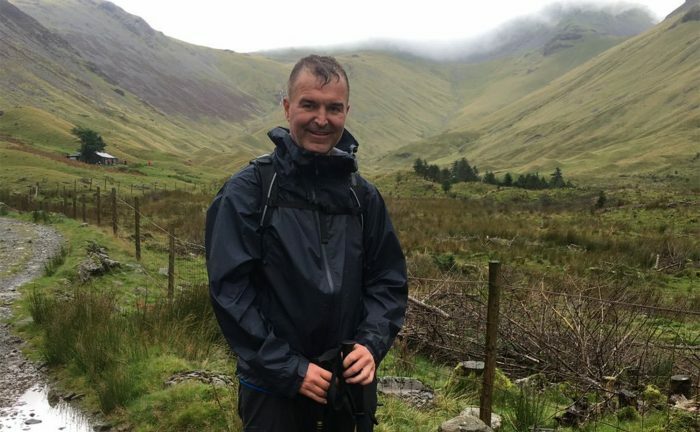 He planned this challenge to raise funds and awarness for Parkinson’s UK, and is champion for the charity’s Walk for Parkinson’s campaign. We’d like to congratulate Dave and the team, and thank Dave for sharing his thoughts on the walk. Read more about Dave’s Coast to Coast Challenge on the Sky Sports Website. His Just Giving Page is at https://www.justgiving.com/fundraising/ClarkysC2C.